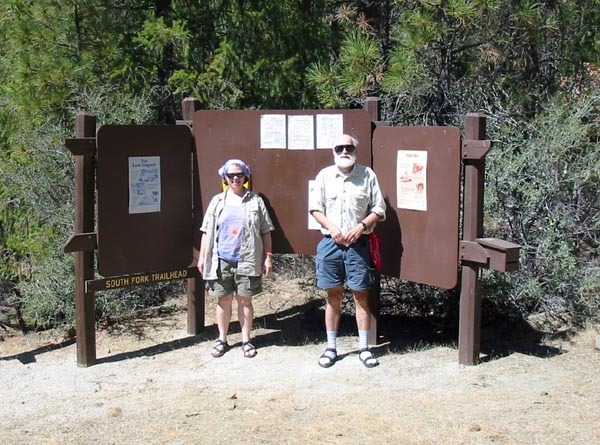 On August 30, 2004, we set out by car for the Trinity Alps Wilderness. and down into the Scott Valley on Hwy 3. In the distance are the Trinity Alps. It's a big climb up over a mountain to the South Fork trailhead near Cecilville. With our radiator troubles we stopped now and then in the shade to let the car rest. Ellen and Scott at the trailhead. For the first six miles or so we followed the Little South Fork Trail. Caribou Lakes, and we'll be following the Little South Fork on up toward the lake. This campsite is well-furnished with log rounds at convenient heights, and mice! to leave a cache of peanuts and granola dangling from a tree over the river. We had an easy day, reaching our second camp in the early afternoon. set out unencumbered by packs to scope out the next morning's route. Following a dry streambed we get our first glimpse of the falls on the right fork. Close up of the lower falls. We found our way, alright, a staircase. Oh my gosh, I have to do this tomorrow with a pack??? Back at camp, we set up our little tent. the waterfall camp in the delta near the bottom of the picture. 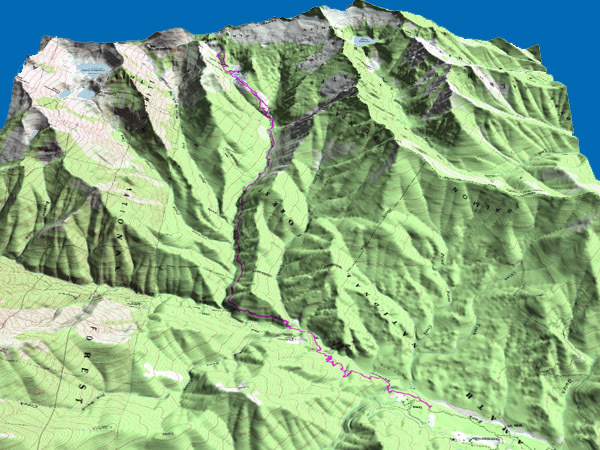 Scott has created a 3D version of the USGS map, showing our track for the whole trek. (you are looking south, so that's to the left) and Grizzly Lake to the west. The next morning we set out again, this time fully loaded. Scott climbing "The Staircase" with his pack. Above the lower waterfall is this steeply sloping rock. It's just possible to keep your footing! From the top of the falls we could see the granite peaks up above. Here are the upper falls. It seems our way will go alongside the right fork at first. get through this," I called. Just step on the branches, he says. Yes, we did come up this rock face. is just visible in the background. and then set out to explore the eastern end of the lake. 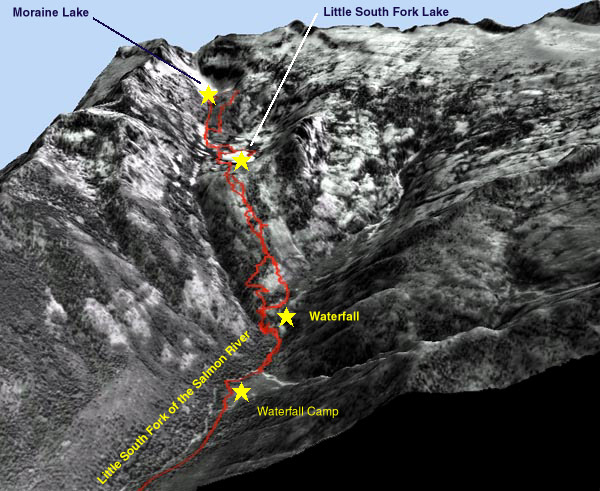 High granite peaks are above Little South Fork Lake. We tricked the camera into seeing what was in deep shadow. From the east end of the lake Scott points toward a peninsula exactly opposite our camp. We loved this SMILING intrusion in a big granite boulder. Nice lips! This is the outlet of the lake, near our camp, the morning of the second day. This has to be one of the easiest stream crossings ever. The waning gibbous moon is just about to go behind the ridge. We go get our counterbalanced bear bags down for breakfast. Then we set out to see if we can reach Moraine Lake, higher on the mountain. so we can find our way home. The rockfall gives way to a lovely meadow filled with wildflowers. We move over to climb up the streambed itself. Note the little waterfall in the background. Here is Moraine Lake, still with its snowfield at the beginning of September. We are blown away by the aquamarine color of the water. Ellen is tempted to dive in from this well-placed cube of granite. We climb above the lake through this charming meadow in a slot. We get to a rocky ridge. From up here we have a perfect postcard view of Little South Fork Lake. That night it is so still that when we wake in the morning there is not one ripple on the lake. This time, trying to avoid the underbrush route, we find a steep path through the woods. Back at the top of the waterfall. Hurray for vibram boot soles. And now, down "The Staircase." After another night at the waterfall camp, we set out down the trail again. Scott checks the GPS reading where the trail cuts through some old mine tailings. It's a long way down, but pleasant going. We see fresh tracks on the trail here, including horseshoe prints going up. But we haven't seen a soul for six whole days. a family on horseback comes out behind us.